Figure 1. The coil of a DC motor is represented as a resistor in this schematic. 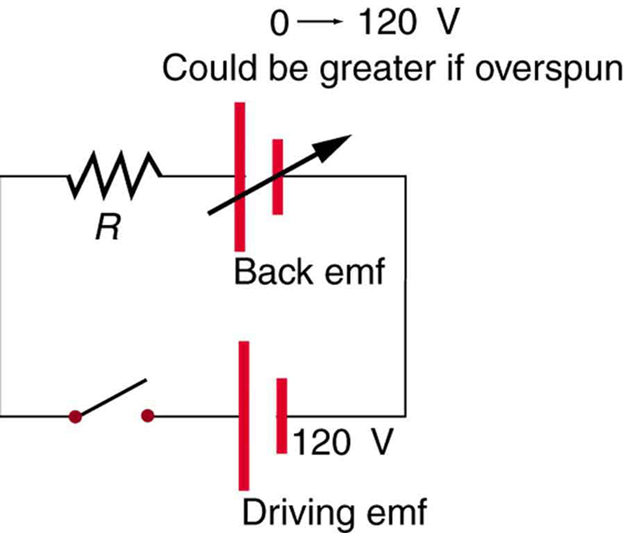 The back emf is represented as a variable emf that opposes the one driving the motor. Back emf is zero when the motor is not turning, and it increases proportionally to the motor’s angular velocity. Back emf is the generator output of a motor, and so it is proportional to the motor’s angular velocity . It is zero when the motor is first turned on, meaning that the coil receives the full driving voltage and the motor draws maximum current when it is on but not turning. As the motor turns faster and faster, the back emf grows, always opposing the driving emf, and reduces the voltage across the coil and the amount of current it draws. This effect is noticeable in a number of situations. When a vacuum cleaner, refrigerator, or washing machine is first turned on, lights in the same circuit dim briefly due to the drop produced in feeder lines by the large current drawn by the motor. When a motor first comes on, it draws more current than when it runs at its normal operating speed. When a mechanical load is placed on the motor, like an electric wheelchair going up a hill, the motor slows, the back emf drops, more current flows, and more work can be done. If the motor runs at too low a speed, the larger current can overheat it (via resistive power in the coil, ), perhaps even burning it out. On the other hand, if there is no mechanical load on the motor, it will increase its angular velocity until the back emf is nearly equal to the driving emf. Then the motor uses only enough energy to overcome friction. Consider, for example, the motor coils represented in Figure 1. The coils have a equivalent resistance and are driven by a 48.0 V emf. Shortly after being turned on, they draw a current and, thus, dissipate of energy as heat transfer. Under normal operating conditions for this motor, suppose the back emf is 40.0 V. Then at operating speed, the total voltage across the coils is 8.0 V (48.0 V minus the 40.0 V back emf), and the current drawn is . Under normal load, then, the power dissipated is . The latter will not cause a problem for this motor, whereas the former 5.76 kW would burn out the coils if sustained. Any rotating coil will have an induced emf—in motors, this is called back emf, since it opposes the emf input to the motor. 1: Suppose you find that the belt drive connecting a powerful motor to an air conditioning unit is broken and the motor is running freely. Should you be worried that the motor is consuming a great deal of energy for no useful purpose? Explain why or why not. 1: Suppose a motor connected to a 120 V source draws 10.0 A when it first starts. (a) What is its resistance? (b) What current does it draw at its normal operating speed when it develops a 100 V back emf? 2: A motor operating on 240 V electricity has a 180 V back emf at operating speed and draws a 12.0 A current. (a) What is its resistance? (b) What current does it draw when it is first started? 3: What is the back emf of a 120 V motor that draws 8.00 A at its normal speed and 20.0 A when first starting? 4: The motor in a toy car operates on 6.00 V, developing a 4.50 V back emf at normal speed. If it draws 3.00 A at normal speed, what current does it draw when starting? The motor in a toy car is powered by four batteries in series, which produce a total emf of 6.00 V. The motor draws 3.00 A and develops a 4.50 V back emf at normal speed. Each battery has a internal resistance. What is the resistance of the motor? 23.6 Back Emf by OpenStax is licensed under a Creative Commons Attribution 4.0 International License, except where otherwise noted.